Last Sunday I had planned on having a blog free day. No writing, no editing, no taking photos for blog posts. Nothing. Nada. Instead I’d decided to treat myself to a proper Sunday off which involved: A walk in the countryside, making something nice for lunch, doing some baking then sitting down with some ginger cake and a movie. We’re so lucky in Brighton that we’ve got the seafront at one end and the South Downs at the other. I love both places but the countryside wins hands down every time. There’s nothing quite like that feeling of freedom I get from escaping into the countryside, looking back over the town and breathing in the fresh air: Of course there is that whole matter of trying to avoid the cows muck. Anyway when me and my dad parked up the car and set off on our walk I was thinking of anything but new blog ideas and edits or photos which was nice for a change so, imagine my surprise when we walked into the tiniest little village and found the cutest campervan cafe serving vegan and vegetarian brunches and homemade cakes in the middle of the countryside. Now how could I not blog about that? This gorgeous little cafe is located in Saddlescombe, a TINY village just a short walk through the countryside from Devils Dyke (which you can get the 77 bus to from Brighton’s town centre). There’s been a cafe here for the last few years (previously The Hiker’s Rest) but the new Wildflower cafe has really upped the game. 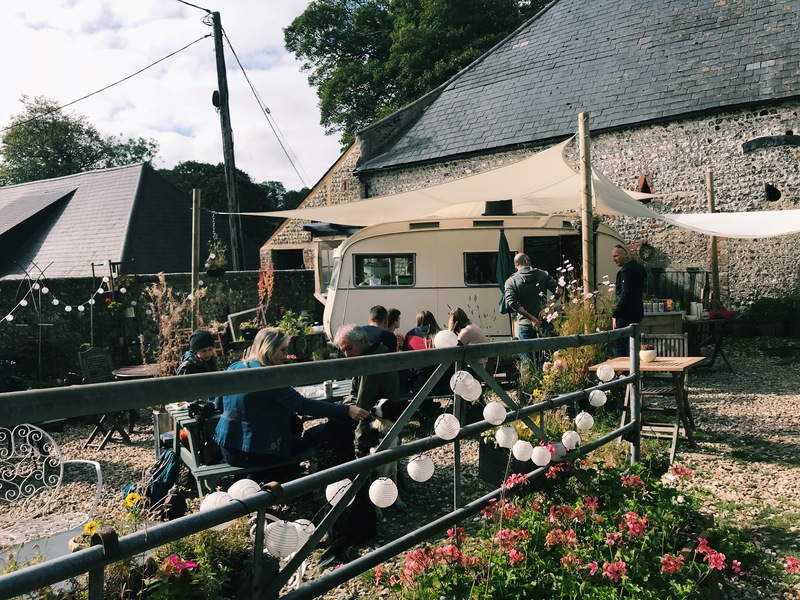 The cafe is located in a camper-van with its own little courtyard seating area that’s beautifully decorated with plants and hanging lights: Even its makeshift plant pots made out of used Golden syrup tins are quaint. It’s probably one of Brighton’s most peaceful cafes and the lack of phone service means that technology is kept at a minimum. Open 10-5 Tuesday to Sunday from March to October and then weekends only in November, it’s a great place to come and get a cup of tea and some cake or a full-blown brunch in the brighter months. Everything is homemade and all of the cakes looked incredible (especially the freshly baked scones that came out just as I was leaving). Plus the best thing is because I’d walked through the countryside to get here, I felt like I totally deserved a sweet treat. All of the brunches are Vegetarian or vegan and very reasonably priced. Options included Mushroom and Blackbean Ragu and Halloumi and Houmous Pita. Everything I saw looked absolutely delicious. (The cafe doesn’t take card payments so just remember to bring some cash with you or you’ll have had a wasted walk).